There are many people across the baseball world who are labeling last night’s contest between the Boston Red Sox and Cleveland Indians as the game of the year. Call it being a victim of bias, but I’m not one of them. Sure, it was an entertaining night at Fenway, complete with lead changes, drama and quite possibly one of the best catches we’ve ever seen. The type of catch you'll tell your grandchildren about. Despite all of this, my focus was less on the spectacle which came with Boston’s 12-10 walk-off win and more on some alarming issues Cleveland has been displaying in the first two games of this series. While the Indians haven’t lost any ground to the second place Kansas City Royals, their current skid has gone a long way in pointing out a few concerning flaws. For one, Cleveland’s two straight losses to the Red Sox have added some hindsight to the nine-game winning streak it went on last week. Of the four teams the Tribe rolled through on said stretch, only one isn’t currently in last place in their respective division. While you don’t want to discredit a streak like the one the Indians went on, the hope was they could continue playing well when facing tougher competition. In two games, we’ve also seen Cleveland’s trademark uneven play thrust back into the spotlight. The “pick your poison” approach we’ve seen the Indians apply to more than a few games this season has been on display in epic fashion so far this series. While Monday’s game displayed an astoundingly weak offensive performance against the struggling Doug Fister, last night’s explosion at the plate was deemed all for naught by a disastrous bullpen implosion. Speaking of which, if last night’s defeat proved anything, it’s that Cleveland’s relievers are gassed. The team’s most notable relief pitchers – Bryan Shaw, Andrew Miller and Cody Allen – combined to allow seven runs in the loss, each having a night they’ll quickly want to forget. All three have seen very high usage this year, and it’s definitely apparent. Deadline acquisition Joe Smith can help, but the fact it’s early August and Cleveland’s marquee bullpen is worn down isn’t encouraging. Their exhaustion has been unfortunately brought on by the fact Cleveland’s starting pitchers from the last two nights have been chased from their respective appearance before the sun went down. Mike Clevinger – who had recently strung together six straight quality starts – exited Monday’s sloppy outing after just three innings. 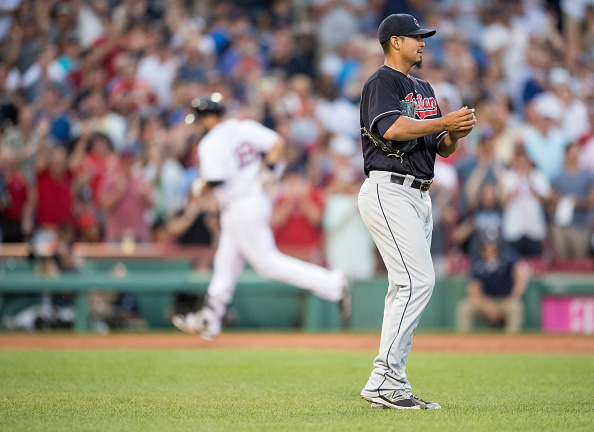 Not to be outdone, apparently, Carlos Carrasco was yanked from last night’s game after just 1.2 innings pitched. Despite being gifted an early 5-0 lead against Cy Young candidate Chris Sale, the Venezuelan gave Boston all five runs back in the second inning. This is a perfect transition into issue we’ve seen to start this week. Suddenly, Cleveland’s lock-down rotation is equal parts hurt and ineffective. Clevinger has now put forth two straight starts where his control was nowhere to be seen. Carrasco has been steadier, but his second half has left a lot to be desired. Meanwhile, Josh Tomlin recently got sidelined with hamstring issues, while Trevor Bauer remains as inconsistent as ever. The Indians front office resisted the urge to swing a deal for a starter at the trade deadline, mainly due to the encouraging performances it was getting from the rotation. However, things took a rough turn immediately after the deadline passed. It’s too early to claim Cleveland made a mistake passing on blockbuster trades, but this will change if the rotation continues to have its share of rough outings. Bottom line – while some saw last night as pure entertainment, Indians fans saw it as a game where their team gave away three different leads thanks to alarming performances from players who are supposed to be key pieces to the roster. As we know, baseball can be a strange sport. The Indians could very well get back on track before we know it. Their aforementioned winning streak occurred after a mind-numbingly dreadful west coast road trip, so nothing’s impossible. That said, after opening the second half with six straight series against struggling teams, Cleveland is finally taking on top-tier opponents. So far, the returns have been far from encouraging.